He came to live at CAPE in 2007 and passed away Tuesday, September 1, 2015. We will always love our Arnie. Arnie was surrendered to the Santa Cruz County Animal Shelter where he remained for many weeks. Each day he would watch his fellow hens come and go as they were adopted. But Arnie, a rooster, continued to be overlooked. When Arnie arrived at the CAPE Animal Sanctuary he was smaller than the resident hens, but his size did not stop him from saving a hen's life. One day a raccoon decided to attempt to kidnap one of Arnie's hen friends. Arnie fought back and almost lost his life. Unfortunately in September of 2015, Arnie passed away. 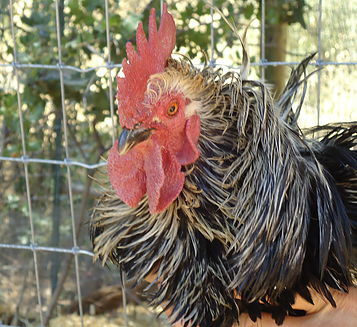 In his memory we encourage you to sponsor another feathered friend at the CAPE Animal Sanctuary. Please consider Boo the hen or Columbus the rooster. 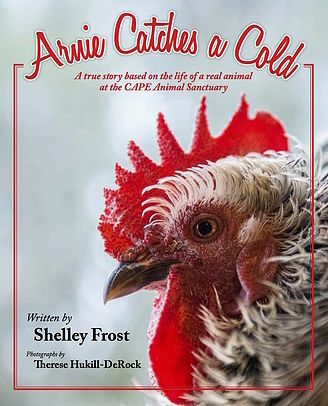 Arnie Catche's a Cold is a children's book published by Mascot Books about a real rooster who lives at the CAPE Animal Sanctuary. Order your copy today! A portion of the proceeds benefit CAPE.